How does a family vacation to the mountains sound? How about a family vacation where you can view the Smoky Mountains from your very own back deck? Welcome to Unforgettable Views and a Theater! This pet-friendly 1-bedroom cabin has space for kids, friends, and family, with a king-size bed, bunk, sleeper sofas, and 2 full bathrooms. 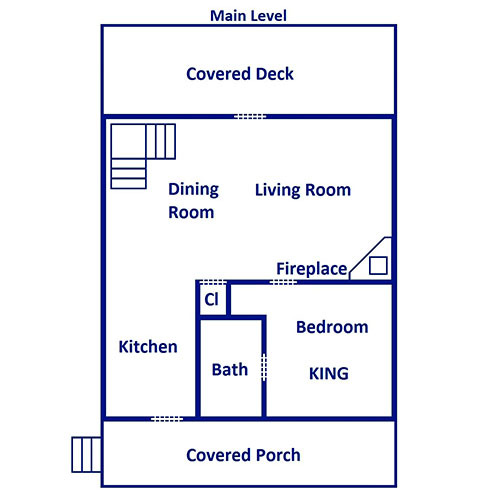 You’ll also find a spacious, open-concept floorplan with a separate rec area for the kids. They’ll enjoy multiple game tables and, of course, a big screen TV for entertainment. 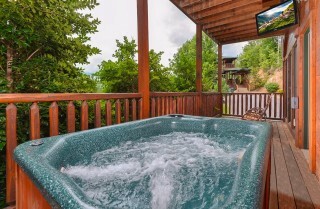 And you’ll enjoy the outdoor hot tub with its own TV on the porch! Even better, Unforgettable Views and a Theater’s amenities aren’t limited to what you find inside the cabin. As part of the Gatlinburg Falls Hidden Valley Resort community, it's convenient to the many awesome attractions, restaurants, and shops in the area! So if you’re looking for the right amount of space, the right blend of relaxation and fun, and the right location, don't miss Unforgettable Views and a Theater! This gorgeous cabin is also perfect for groups because of its location: 500 feet from 3 other awesome cabins! Check out Views Above the Rest, Cherokee Dreams Lodge, and Splash 'N Views if you need more space for a wedding, special occasion, or big family reunion. Booking them all together is a great way to have privacy and proximity! A cozy living room with warm wood walls and a carpeted floor awaits you inside Unforgettable Views and a Theater. This is a great place to relax after exploring the scenic valley known as Cades Cove or seeing the sights from the Gatlinburg Space Needle. Inside this cabin’s living room, enjoy 2 plush couches—one full-size and one matching loveseat. You’ll have seating for at least 5 guests and plenty of options for entertainment. Watch a favorite movie or TV show on the large flatscreen mounted above the electric fireplace, or spread out a game on the coffee table in the center of this room. Use the end tables for keeping drinks or bowls of your favorite snacks. Great party recipes include homemade Chex mix and white chocolate popcorn (it’s addictive—try it!). 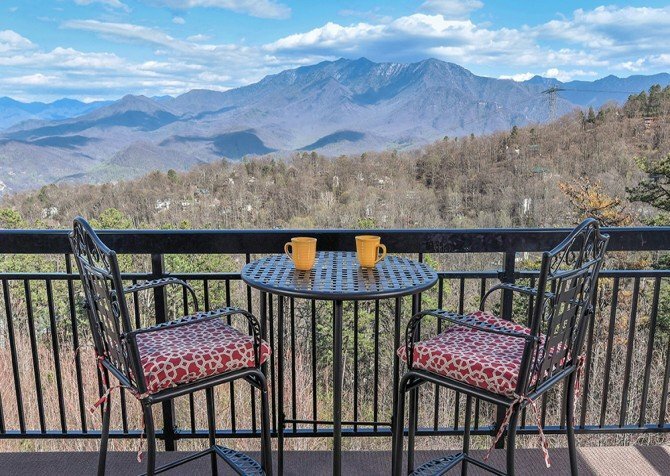 The large kitchen inside Unforgettable Views and a Theater is exactly what you’ll need for your small group getaway or family vacation to Gatlinburg. You can save on gas and money by stopping at the local grocery store on your way to the cabin and eating in for at least 2 of your 3 meals each day. Make mealtime easy and stress-free in the cabin by stocking up on cereal, toaster pastries, and/or bagels for the morning. And lunch can be as simple as submarine sandwiches and chips. Or, if you’re visiting in the winter, leave a pot of soup on the stove and let your guests fix a bowl as they please. After saving so much money on breakfast and lunch, you won’t feel guilty about venturing into Gatlinburg—which is less than 3 miles from this cabin—and enjoying a delicious dinner with the family at the end of the day. Along with your full-size kitchen, back porch with amazing views, and large rec area, what sets Unforgettable Views and a Theater apart from a typical hotel room is its separate dining room with a 6-piece dining set. You can use this table for an intimate family meal during the holidays or clear away the dishes for a family game night in the cabin. Surrounded by large windows with picturesque views, this dining room is a beautiful place to get together with friends and family in the Smokies! When you book your stay at Unforgettable Views and a Theater, your getaway to Gatlinburg will not only provide plenty of space for the whole family, but also a variety of ways to have fun! 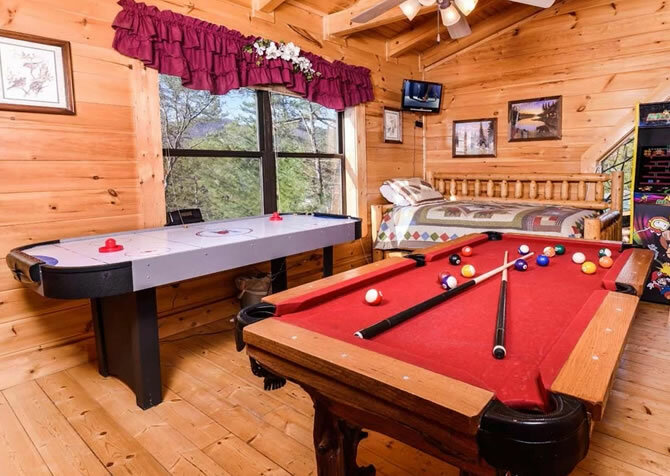 Simply step into this cabin’s rec room, and you’ll have multiple options for indoor entertainment, including a full-size pool table, arcade game, and foosball table. If you’re traveling with teenagers, they’ll love having a separate hangout space that’s all their own. Or if you’re bringing a small group of adults to the Smokies, this room makes a great bachelor pad in the evenings. 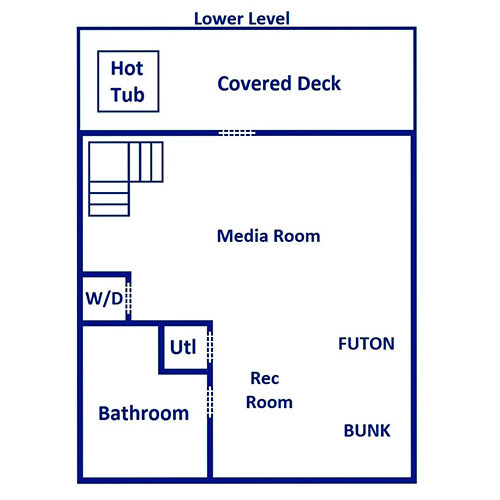 Besides the game tables, the rec room offers a cozy movie area with a big screen TV, DVD player, and Blu-ray player. Lounge on the comfy couch in front of the big screen TV for a perfect way to spend a rainy afternoon. Finally, make great use of this space by turning it into an extra bedroom in the evenings. The sleeper sofa and full-size bunk bed provides a comfy place to unwind after hours of indoor fun! While the kids will love crashing in the large rec room of Unforgettable Views and a Theater, we understand that parents need their own space to relax in the evenings. 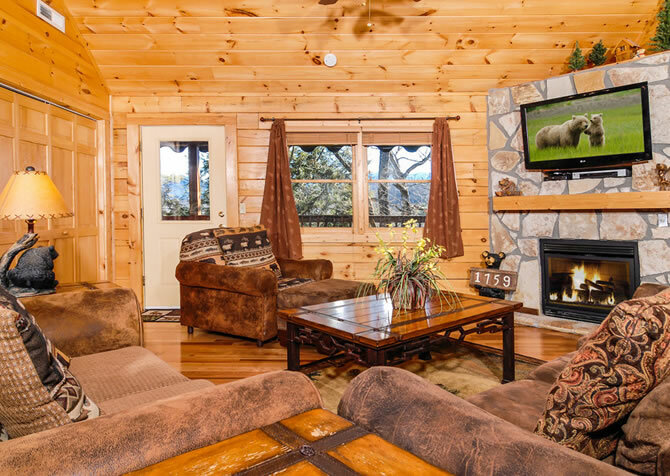 That’s why this cabin offers a large, private bedroom with a king-size bed, its own flatscreen TV, and all the cozy furnishings you enjoy at home, including a ceiling fan, side table, and reading lamp. Before climbing into your comfy bed, try a soak in your heart-shaped jetted tub first! There’s also a second full-size bathroom for guests sleeping on the bunks or one of 2 sleeper sofas found in this cabin. With all the additional sleeping options, you can comfortably accommodate up to 10 guests inside Unforgettable Views and a Theater—a perfect size for a family vacation or any small group getaway! Now this is what it’s all about: sweeping views of the mountains surrounded by old-growth trees and a rocking chair porch where you can soak in the sights from the comfort of your cabin. If you’re planning a getaway to the Smokies, you need to check out picturesque cabins like Unforgettable Views and a Theater! This Gatlinburg cabin offers multiple rocking chairs and a swinging wooden bench, where you can relax in front of the rolling hills. 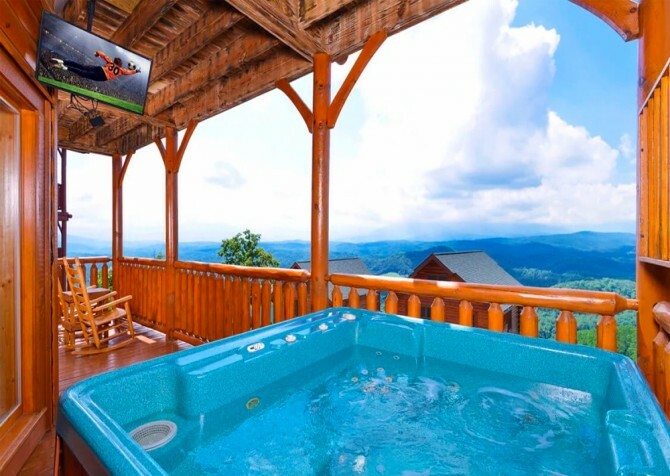 You’ll also enjoy a charcoal grill for family barbecues on Memorial Day weekend in the Smokies and, better still, an outdoor hot tub with its own outdoor TV! Other convenient amenities provided by Unforgettable Views and a Theater include a flat, paved driveway, providing easy access to and from the cabin. You’ll also have access to a washer/dryer and to wireless internet during your stay. We don’t want any conveniences of home to be left behind while you’re enjoying your time in the mountains! One of the top-rated aquariums in America, Ripley’s Aquarium of the Smokies features multiple underwater displays and a variety of interactive exhibits that are fun for the whole family! Conveniently located on the Parkway in Gatlinburg, this popular attraction lets you fly down the mountainside at speeds of up to 25 miles per hour! If you’ve never gone whitewater rafting before, don’t your chance to ride down the Big Pigeon River with Rafting in the Smokies! *While this cabin has Wi-Fi, data is limited. Please limit use of streaming sites (Amazon, Netflix, Hulu, YouTube, etc.). Guests will incur additional charges for excess data usage. "We stayed in Unforgettable Views and a Theater and have a wonderful time. It was nice cooking and enjoying family meals together. The four boys had the downstairs to themselves and thoroughly enjoyed it. We enjoyed coffee on the deck without waking them too. The staff made everything very easy and they were very nice to deal with. Definitely recommend them!" "My group of 7 loved this cabin and the views were actually unforgettable. We loved getting up in the morning, cooking breakfast, and reading on the main floor patio. The games on the bottom were an amazing touch so we spent our New Year’s Eve night having a game night in. Most importantly, the cabins were so close to downtown (~17 mins) and local hiking trails (~25 mins). I will say parking seemed limited, especially for a place that says it could fit 10."